Temporary Protected Status (TPS) holders Mohammad Alala his wife Dania, both from Syria and their two U.S. born children Taim and Amr play at a playground at their home in Miramar, Florida, U.S., Jan. 24, 2018. The Trump administration said Wednesday it would allow about 7,000 Syrians to remain in the United States for at least another 18 months under protected status as civil war rages in their native country. The decision was a relief for the Syrians, who would have faced the prospect of returning to a fractured country racked with violence if the administration had rescinded their temporary protected status (TPS) when it ran out in March. Instead, they are allowed to stay through Sept. 30, 2019. “After carefully considering conditions on the ground, I have determined that it is necessary to extend the Temporary Protected Status designation for Syria,” said Department of Homeland Security Secretary Kirstjen Nielsen in a statement. “It is clear that the conditions upon which Syria’s designation was based continue to exist, therefore an extension is warranted under the statute,” she added. The administration stopped short of redesignating Syria’s status, which means that it will continue to benefit only Syrians who have been in the United States since 2016 or earlier. 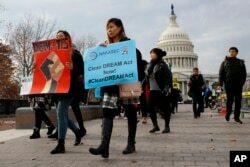 FILE - People march in support of the Deferred Action for Childhood Arrivals (DACA), and Temporary Protected Status (TPS), programs, Dec. 5, 2017, on Capitol Hill in Washington. The Obama administration granted Syrians temporary protected status in 2012, the year after the war in Syria began, and extended it through the end of March. The Obama administration redesignated Syria’s protected status several times so that waves of Syrians who had arrived in later years of the conflict could qualify. There is no end in sight to the Syria conflict. A peace conference in Russia ended Tuesday with a call for democratic elections, but key opposition demands were ignored after squabbles and heckling of the Russian foreign minister. The Trump administration has shown a deep skepticism toward the protected status program, announcing its end for immigrants from El Salvador, Haiti, Nicaragua and Sudan since President Donald Trump took office last year. Some of those countries were granted the protections more than a decade ago, and the administration argued that their crises had since been resolved. Refugee advocates criticized the Trump administration’s decision not to re-designate Syria’s status, saying it ignored the fact that Syria’s conflict continues to produce new refugees. “The Trump administration’s decision means that many Syrians who are already here in the U.S. will not be able to apply for TPS status,” said Lia Lindsey, Oxfam America’s senior humanitarian policy advisor.